Most devotional books for moms focus on the sweet, touching aspects of motherhood. 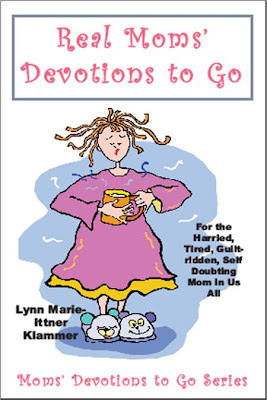 Real Moms’ Devotions to Go is for the harried, tired mom who is long on love, but short on time. It gives the reader real-life stories that she can easily identify with and the added benefit of concrete, stress reduction techniques that she can quickly learn and use. Real Moms’ Devotions to Go not only entertains, but nourishes as well. It has a down-to-earth, realistic approach of the devotions and the mental health aspect of the stress management portion of the book. Lynn Klammer is a licensed Clinical Psychologist, educator and best-selling author of Christian books for children. Her award-winning literary work has appeared in a variety of magazines both in the United States and Canada. It's no secret that I love reading devotionals. To take a moment with God each day always leaves me feeling better inside. What this book teaches you is not only to talk with God, but to take time to mother yourself too. As mothers, we often neglect ourselves to put our families first, that will never change, but what mom's need to do is take a few minutes each day for themselves too. Take a bath, go for a walk around the block, read a book for a few minutes, whatever it is doesn't matter as long as it is what you want to do for you. You will feel better and be better for your family.